Scott's basketball club team, called Supreme Court, holds practices on Wednesday evenings and Saturday mornings. Usually, the practice in the Horizon High School gymnasium. 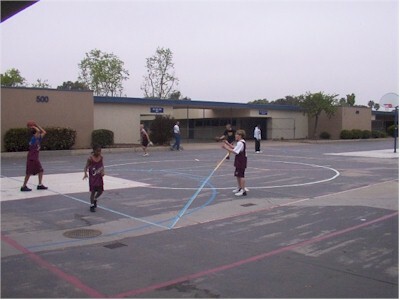 When the gym is in use for other purposes, they practice outdoors, here in the schoolyard. Supreme Court has two teams, who practice together but play separately. Scott is in the younger group. This has been a good experience for Scott. In the rec league (RPB), Scott usually plays point guard. On the Supreme Court team, he plays center or power forward. Amazingly, he's quite good at both roles. Obviously, he got his basketball talents from his mother, who played on her high school team back in Kokomo. Scott and I went straight from basketball to play a game of disc golf at Morley Field. We think it's the first time we've played all year. I shot a 57; Scott had 72. Both of us were very rusty. Matt and Susan went to a Key Club event - a beach cleanup at Pacific Beach.